To Cite: Aribas B K, Tiken R, Aribas O, Uylar T, Akdulum I, et al. Factors on Patency Periods of Subcutaneous Central Venous Port: Long-Term Results of 1,408 Patients, Iran J Radiol. 2017 ; 14(2):e36816. doi: 10.5812/iranjradiol.36816. Background: Studies have reported factors affecting the efficacy of subcutaneous venous chest port catheters placed into jugular or subclavian veins using a radiological technique. There is ongoing debate for this efficacy in these series. Objectives: To examine factors on patency times, including complications of subcutaneous venous chest port insertions, using ultrasonography guidance in 1,408 patients over a long-term follow-up. Patients and Methods: Between April 2009 and March 2014, subcutaneous venous chest ports were placed in 1,408 patients, 574 women and 834 men (mean age, 55.4 ± 12.1 years). Factors affecting the port patency were examined. Age, gender, access, malignancy site, and coagulation parameters were variables. A multivariable Cox regression test was used. Additionally, the successes were compared by univariate Kaplan-Meier survival analysis. Results: Fifty-seven patients underwent port removal because of complications. Complication due to catheter patency time, as number of specific complication per 100 catheter days divided by total patency days shown in parenthesis. Ports were explanted in 29 patients because of thrombosis (0.0054), in nine patients because of infection (0.0017), in eight patients because of catheter malposition (0.0015), in five patients because of bleeding (0.0009), in five patients because of skin necrosis with infection (0.0009) and one patient because of a port reservoir flip-over (0.0002), of a total of 57 patients (0.0107). The patency was similar in the two central veins (P = 0.230). No factor was significant except for the malignancy site (P = 0.002). The malignancy site and gender were significant factors for thrombosis. Port removal was significantly higher in extremities involving two regions and in female patients. Conclusions: Patency was not different between two venous access groups. The malignancy site was the only significant factor for success. Infusion therapy via a subcutaneously implanted venous port system is an attractive alternative to infusion via peripheral veins, peripherally inserted central catheters or tunneled catheters (1). The use of subcutaneous infusion ports has become the standard practice to obtain long-term venous access for administration of chemotherapy, antibiotics or parenteral nutrition (2). Subcutaneous venous chest ports were first surgically implanted by Niederhuber et al. in 1982. Ports were then placed by Morris and coworkers with radiological guidance (3, 4). Studies have reported factors affecting the efficacy of subcutaneous venous chest port catheters placed into jugular or subclavian veins using a radiological technique (1-4). There is still disagreement for this efficacy in these studies (1-23). Our objective is to examine the factors on the patency times, including complications of subcutaneous venous chest ports insertion, using ultrasonography (US) guidance in 1,408 patients over a long-term follow-up. From April 2009 to March 2014, ports were placed using ultrasonography in 574 (40.8%) women and 834 (59.2%) men, with a mean age of 55.4 ± 12.1 (range; 16 - 84) years. All of the patients except one with Behcet’s disease had malignancies with or without metastases. The patient and procedure features, including age, gender, and access method as jugular and subclavian routes, location of primary malignity, coagulation parameters, complications, and previous chemotherapy were recorded in this retrospective study. Only 36 patients underwent previous chemotherapy, but most of the patients did not undergo peripheral venous catheter chemotherapy before port insertion. The physician’s primary plan regarding ports was lifetime port. All the catheters were planned for lifetime, but they were removed after successful therapy in 26 patients. Chest ports were not only limited to the chemotherapy period, they often remained in place after chemotherapy. Consequently, we have not included chemotherapy courses and drugs in the study. All of the ports with a titanium chamber were single-lumen, standard sized (7 - 8 F) port systems with a locking mechanism for catheter attachment. Right chest side was our first choice, but left chest side was chosen in case of thrombosis and radiotherapy previously given to right side leading to scar tissue on the thorax wall. Platelet count, prothrombin time, and international normalized ratio (INR) were tested before each port placement. The deficiencies were corrected in coagulopathy. Any antibiotic for prophylaxis was not administered. Patients with any infection, uncorrected coagulopathy (in platelet count < 30/nL and/or INR > 1.8), or inability to give informed consent were excluded. Jugular and subclavian venous accesses were obtained by ultrasonography in our department of Oncology Hospital. The chest region was cleared lying on supine with antiseptic. Our first choice was subclavian approach in the first 2 years; afterwards, we mostly chose jugular entry for easiness. Skin dissection was performed for chest pocket after central venous entry by Seldinger method. The tip of the port catheter was also evaluated fluoroscopically, and chest graph was taken in all patients. The chest port was used 3 hours after the procedure. Follow-up, analysis of results, and statistics are explained below. Informed consent was obtained from all patients. The authors have no financial interests related to the material in the manuscript. Our institutional review board (IRB) approved the study. The follow-up was accepted from the procedure to port removal, final follow-up, and exitus, and the patients were categorized according to those criteria. Groups by access were as jugular or subclavian. Age, gender, venous entry method, and coagulation parameters were examined as variables in the multivariable survival test. Malignancy location was in four areas: abdominopelvic, breast-thorax, head-neck, and extremity-involving two regions. Because of the small number of involving two regions in 18 patients and extremity region in 33 patients, they were combined. Complications were accepted to guideline reported by Lewis et al. (5). Due to this guideline, we have reported the number of complications as a function of the device/access site interval. In this equation of complication due to catheter patency time, number of specific/total complication per 100 catheter days has been divided by total catheter patency days. In fact, the time from placement of the chest ports till removal was defined as the patency time. Endpoints were port explantation, death of the patient, or end of follow-up period. Any complication that occurred within 30 days of the procedure was defined as early complication. Complications occurring after 30 days were defined as late complication according to the guideline (5). An event (failure) was defined as unplanned port removal as a result of a complication, so groups were divided as failures and successes. Patients with replaced catheters instead of removal catheter were not entered into the study for the second time. Categorical variables were analyzed via Chi-square test, whereas scale variables were investigated via Student t-test for comparison of demographic features. Using number of port catheter indwelling days as a dependent variable, univariate analysis via Kaplan-Meier test was performed to determine the possible association between each of risk factors and shortened survival of port systems via log-rank test. Cox proportional hazards regression test was examined to calculate the impact on port survival of the selected variables. Cox regression analysis was performed via stepwise model with entry 5% and removal 10%, maximum iterations 20, model entry, and displaying model information at each step. Significance was accepted at P < 0.05 and a 95% confidence interval in analysis, after P values were found via survival/statistical test. Survival plots for catheter patency were obtained. No major complication was detected in the procedure. Two major complications occurred after the procedure in the jugular group; one was skin necrosis with infection in a 69-year-old male patient after 132 days as late complication and the other was bleeding because of a prolonged INR (1.70) on the second day in a 29-year-old male patient as an early complication. Blood was given to the 29-year-old when the port was removed. Table 1 shows patient characteristics and patency time of port catheters. Placement of port catheters was made into the jugular and subclavian vein in 1,302 patients (92.5%) and 106 patients (7.5%), respectively. The mean catheter day was longer for subclavian access than for jugular access, 508.9 days vs. 368.1 days, respectively. The left side was chosen in 15 total patients (eight patients with radiotherapy previously given to the right side for breast carcinoma), with jugular entry in 13 patients and subclavian entry in two patients. Table 2 shows patient characteristics and patency time due to success and failure. aValues are expressed as mean ± 2SD or No. (%). bCategorical variables were analyzed via Chi-square test, whereas scale variables were investigated via Student t-test for comparison. cEighteen patients had malignancies involving 2 regions. Chest ports were removed due to ending of chemotherapy in 26 patients, and 63 exitus were those whose port catheters were functional at the time of death and follow-up was continued until death. Port was removed for failure in 57, 50 jugular entry and 7 subclavian entry (Table 3). A successful lifetime catheter also had these situations: I-correct function up to the end of the patient life in 1,262 patients, II-removal after successful chemotherapy in 26 patients, III-death of patient during/after chemotherapy in 63 patients [and early exit of 89 patients from study in II and III]. bComplication rate due to catheter patency time was number of specific/total complication per 100 catheter days divided by total patency days (total catheter patency days: 533,157 days in total, 479,211 days in jugular, and 53,946 days in subclavian routes). cPatency rates were 96.2% in jugular access and 93.4% in subclavian access, respectively. dNineteen (65.5%) in female patients and 10 (34.5%) in male patients. eInfection accompanied by skin necrosis in a patient. f57 complications were observed in 57 patients. In the subclavian access group, thrombosis was observed in three (two catheter thromboses) patients, malposition with nonfunction was observed in three patients, and infection was observed in one patient. In comparison with jugular access, thrombosis was observed in 26 (15 catheter thromboses, 11 jugular and/or brachiocephalic vein thrombosis) patients, infection was observed in eight patients, malposition which led to nonfunction requiring a novel port catheter was observed in five patients, hemorrhage was observed in five patients, skin necrosis (skin necrosis with wound infection) was observed in five patients, and one reservoir flip-over was observed. Among them, 24 were early complications (22 jugular and two subclavian) and 33 were late complications (28 jugular and five subclavian). Complication due to catheter patency time, as number of specific/total complication per 100 catheter days divided by total patency days; removal of the port systems resulting from complications was 0.0104 in jugular access and 0.0130 in subclavian access. Additionally, port infection per 100 port catheter days was seen in 0.0017 in jugular access and 0.0019 in subclavian access. 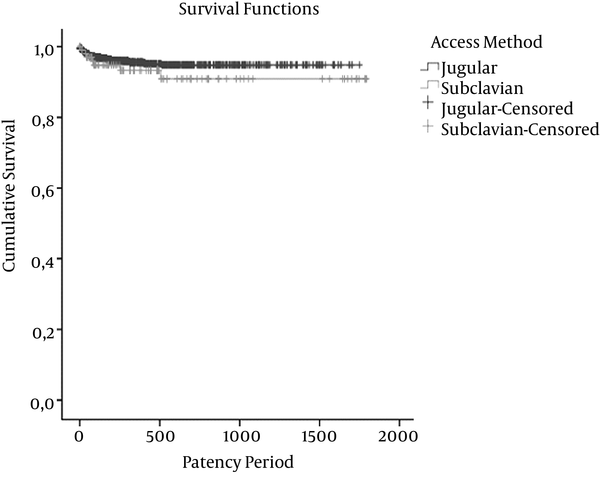 Figure 1 shows catheter patency periods of jugular and subclavian accesses in Kaplan-Meier test. The log-rank test was not different (P = 0.230). Cox regression analysis is shown in Figure 2. Age (P = 0.846), gender (0.264), venous entry groups (P = 0.344), site of primary malignity (P = 0.002), and coagulation parameters, thrombocyte (P = 0.188), and INR (P = 0.300) were not significant variables except for malignancy site in this multivariable test. Their platelet counts (nl) were 270.2 ± 102.2 in the failure group, 290.9 ± 106.3 in the successful group, and 290.1 ± 106.2 overall. The mean estimated patency times (days) which were mean for survival time in Kaplan-Meier survival analysis were 1.533.3 ± 23.6 days in head-neck (P = 0.727), 1,406.2 ± 51.3 days in thorax-breast (P = 0.035), 1,720.1 ± 13.1 days in abdominopelvic (P = 0.003), and 1,360.8 ± 91.5 days in an extremity involving two regions (P < 0.001). 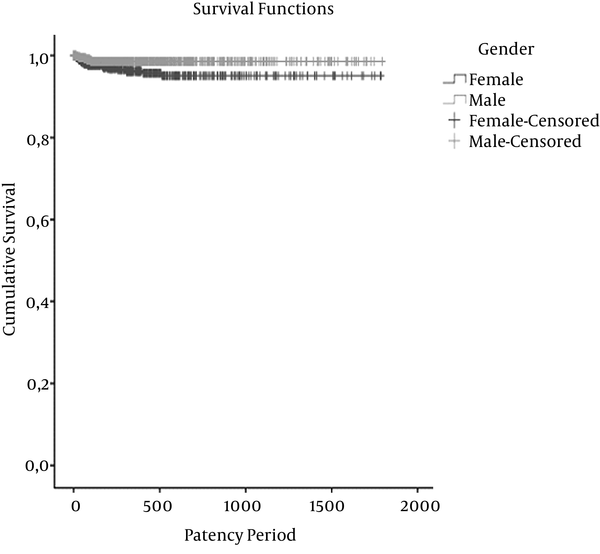 Figure 3 shows the cumulative survival for catheter patency times for thrombosis of the gender groups in the Kaplan-Meier survival analysis (P = 0.008). This was also significant in multivariable analysis (P = 0.044). The mean estimated patency times (days) were 1,708.4±18.5 days in female patients and 1,769.4 ± 7.7 days in male patients. The mean estimated patency times (days) for thrombosis were 1,581.7 ± 10.3 days in head-neck (P = 0.156), 1,464.4 ± 44.1 days in thorax-breast (P = 0.072), 1,752.8 ± 9.4 days in abdominopelvic (P = 0.328), and 1,518.7 ± 69.8 days in an extremity involving two regions (P = 0.030). 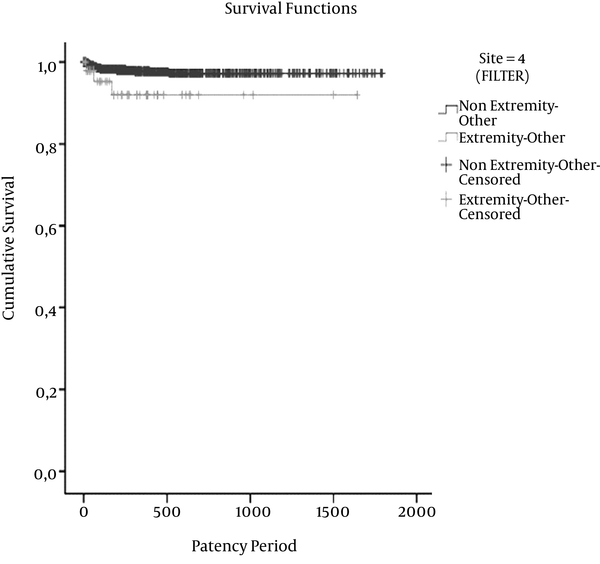 Figure 4 shows the cumulative survival for the catheter patency times for thrombosis of the extremities-involving two regions and other region groups in the Kaplan-Meier survival analysis. Figure 4. 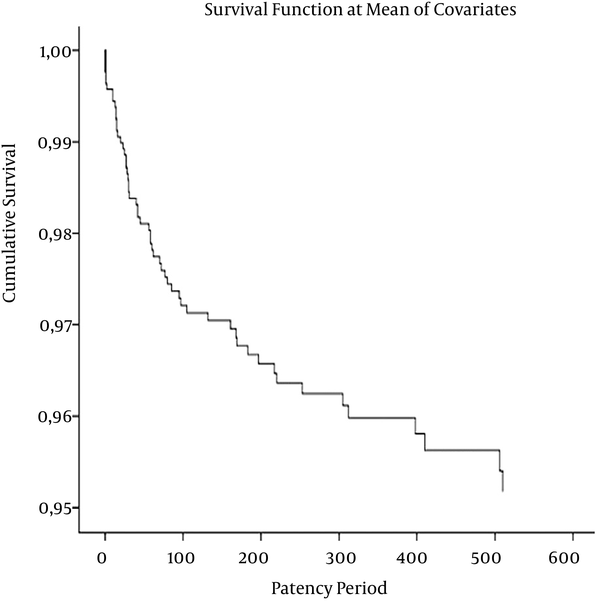 Chart shows cumulative survival for catheter patency times of extremities-involving two regions and other region groups in Kaplan-Meier survival analysis for thrombosis (P = 0.030). The mean estimated patency times (days) in thrombosis were 1,518.7 ± 69.8 in an extremity involving two regions and 1,749.6 ± 9.0 in the other region groups. Thrombosis rate in our study was 2.8% in the subclavian group and 2.0% in the jugular group or 0.0056 and 0.0054 per 100 catheter days, respectively. We have seen an increased tendency to observe a thrombosis in female patients (65.5% vs. 34.5%). Additionally, we have detected a difference in the likelihood of thrombosis in patients. Thrombosis was significantly higher in extremities involving two regions than in the other regions. Port infection was reportedly lower for subclavian vein access than for jugular access or other access sites; however, no randomized trial has satisfactorily compared infection rates for catheters placed in jugular, subclavian, and femoral sites (4-15). We did not differentiate infection percentage due to catheter patency time per 100 catheter days, as 0.0017 jugular and 0.0019 subclavian. We also could not incubate bacteria in two port infections because of a given antibiotic treatment. Other complications are necrosis of the skin, malpositioning with nonfunction, displacement, and thrombosis, which are rare (2, 15-17). The catheter tip position is less subject to migration in the jugular venous entry (3). In our study, we also found displacement percentage due to catheter patency time per 100 catheter days was 0.0010 in the jugular entry and 0.0056 in the subclavian entry; skin necrosis was 0.0009. We found no skin necrosis in the subclavian access group, whereas five skin necrosis cases were observed in the jugular access group. Subclavian access was more successful in 55 patients with US guidance in the series reported by Brooks et al. (18). Additionally, we did not observe apparent catheter pinching which may be seen in subclavian access, but some pinch-off might affect catheter thrombosis at the subclavian entry. Recently, two series (14, 15) have shown that port placement via subclavian vein is successful in addition to a series that performed port placement via the jugular vein reported in the literature. However, we did not find any significant difference between these venous entry methods. In addition, port inversion or flip-over is a very rare complication (19-23). It was very rare in our study as well. We accept that our study had limitations that originated from its retrospective nature. Studies examining chest port catheter efficiency should be studied prospectively. Our choice was subclavian approach in the first 2 years, whereas we chose jugular entry afterwards. The reason for this change was that jugular method is more practical, shorter, and more painless than the subclavian approach. In addition, the infection rate was higher in subclavian access, so the results may have been affected by personal experience during the procedure. Breast cancer patients that undergo radiotherapy to the chest may have an increased risk for catheter removal, but we avoided this site for catheter placement. The history of previous chemotherapy was found in only 36 patients having a lifetime port catheter, and this could not be evaluated in the analysis because the number of patients was too small to allow a consistent assessment with 95% confidence intervals. We did not find any effective factor on the catheter patency times, except for malignancy site (p = 0.002), by multivariable analysis. The thrombosis rates were lower in the head and neck (0.6%) and abdomen (1.9%) than in the thorax and breast (4.4%) as well as in extremity involving two regions (5.9%). In conclusion, there was no significant difference between factors regarding patency times, including complications in jugular vein access or subclavian vein access, using ultrasonography, with the exception of the malignancy site. The malignancy site and gender were significant factors for thrombosis and were significantly higher in an extremity involving two regions and in female patients.